This one is dedicated to Ashley at Hops because a) I think she’s pretty spectacular, as a person and as a blogger, b) because I know she has a thing for goat cheese the likes of which few can appreciate, and she also loves beets, and c) she’s just recently engaged! And I wanted to give her something of an engagement gift. Here you go, Ashley; a toast to your engagement. Yay! Over the holidays this year, I felt a little like I had lost my mind. Not necessarily in a bad way, but in the way that I felt I had something going on at all times. Pre-festivities, there was shopping and wrapping, and the inevitable organizing of the wrapped gifts into bags so you remember who gets what when you go to each place. I was pretty proud of myself; everything was done prior to my mom and sister arriving, which is a major accomplishment for me. But then…chaos. Because despite me having everything organized, gatherings and the inevitable food for those gatherings seemed to take up a big part of the past few weeks. My kitchen, which is normally filled with activity, was even more wrecked than normal; I can barely tell you what I made, but I remember it was really delicious, and I ate far too much of it. My most favorite part of this chaos was what we did for New Years Eve (and maybe that’s because it marked the end of the food rush). I told you a little bit about it my lemon ginger fizz post (which I had again today, sans ginger ale, and it’s like an extremely refreshing winter sno cone – I was thrilled), but I created a toast-filled New Year’s Eve party. Toast like “raise your glass?” No way, people; toast like toast. It was fantastic; each one of them exceeded my expectations in terms of flavor. The crab dip and tomato basil ones were favorites from a christmas party we went to, the pear/walnut is just something I love to eat, and the brie/caramel one was a riff on a brie en croûte I made years ago (pre-blog) for a New Year’s party. I’m still working on the french onion soup one; It was amazing, but I want to fine-tune it and (ahem) actually write the recipe down this time, but it really is one for the books. If you like french onion soup, you’re really going to want this for a snack/appetizer. My favorite of the toasts? The beet one. I knew going in that it wasn’t going to be fair to the other toast creations, because beets? They are beautiful. And like brussels sprouts, an alarming amount of food bloggers worship them, and I’m one of them. They are earthy, sensuous little burgundy things; the prettiest by far of the root vegetables, in my opinion. Little known fact: in high school, I spend a year of my life with beet-colored hair. No lie. Remember Manic Panic, which you could use to dye your hair any color of the rainbow? They had a lovely one (it was either New Rose or Fuchsia Shock), and since I know they used vegetable and other semi-permanent stuff in there, one can only imagine I was putting actual beet juice in my hair. So I was crazy in high school; big surprise, I’m sure. Back to the toast post. Making a crostini bar is pretty great, for both the guests and the hostess of a party. If you plan correctly, it’s simply a matter of a little prep ahead of time, some cute dishes to arrange your topping choices on, and if needed, some flags to label what everything is. If I were to do this for a larger gathering than the three of us that were here (yes, and let’s take a moment to absorb how I felt the need to make six different layered crostini choices for three people), I would also include a little menu with suggestions for how to assemble. Certainly, there’s a mix and match aspect to some of these, and your guests can tailor them, to some degree, to what they want. I wish I had taken photos. It’s not that I didn’t think about it, but the key word in New Year’s Eve? it’s eve. As in, late at night when there is zero natural light. Someday I will crostini bar it out for you in broad daylight, and there will be photos. 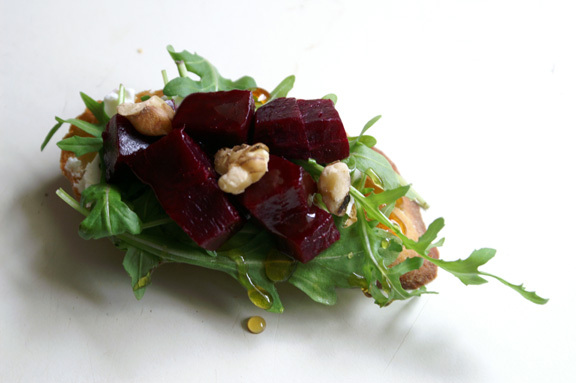 For now, just let your mind wander, and zone in on the beauty that is the roasted beet crostini. Why roasted beet crostini is great: the combination of flavors is lovely, the colors are eye-popping and very elegant, and due to the weight and textures of the combined ingredients, it stays together quite well during the few bites it takes to conquer it. Obviously your white-dress-wearing guests may hesitate to eat something with a massive amount of pigment, but give them a small plate and napkin and tell them to eat carefully, and they’ll be fine. We didn’t spill a single beet. I also enjoy these because they’re light; the lightest crostini we had at the party, in fact. Aside from the thin layer of goat cheese, everything else is basically salad – and a good, healthy salad at that. So it’s a nice break in the action if you’re serving heavier things alongside. I know we’re in the midst of football playoff season here, so it isn’t lost on me that parties are still on the horizon for many of you. Most of those parties will involve nachos and potato skins, and other diet-busting selections. Take these along if you want to have something fun to eat that doesn’t make you feel like a quivering pile of guilt later on. I would say these are adapted from something, but I thought of most of my crostini after some half-hearted online recipe browsing. So…inspired by the internet and its wide variety of ideas, but I can’t pinpoint it to a single source. *crostini is about individual preferences and fun, not about exact measurements. What i’m giving you is enough so you have what you need, and you may have leftovers for some ingredients. Better that than to run out, right? Right. **my grocery carries “half-baked” loaves, which are ideal for this. Why? Because you don’t even need to bother baking them before you slice and toast them into crostini. I find that it actually works better when you begin from a “half-baked/bake-at-home” place, as your crostini tend to hold together and not get as dry or crumby. ***you’ll use this according to the creaminess of your goat cheese, as well as your own personal feelings on how smooth it should spread. I didn’t use the cream, but if you feel like you want the goat cheese slightly less pasty, then add some in sparingly, bit by bit, until you get the consistency you want. Heavy cream works well with cheeses like this to smooth things out without altering the taste or making it runny. If you roast beets regularly and prefer a given method, be my guest. For this recipe, I like scrubbing the beets, rubbing them with a little olive oil, and individually wrapping them like a baked potato. Place them on a sheet pan and roast for 1 hour. Once done, remove them from the oven and let them stay in their wrappers for another 30 minutes or so until it’s safe to unwrap them without burning yourself. Allow to cool completely to room temperature. Preheat your oven to 400˚F (or, if you prep during the beet roast, your oven will already be hot) and line a baking sheet with aluminum foil. Toast in oven for 10 minutes, checking at the 5 minute mark to see how things are going. The type of bread you use really makes the time vary, so they could be in for anywhere from 7-8 minutes to 15, depending on the density of the bread. Checking at the 5-minute mark should give you a good indication of how long it will take. Flip them over when the bottoms look toasty to allow the other side to get golden. When fully toasted on both sides and golden brown, remove them from the oven and transfer to a cooling rack to cool completely. Goat cheese: plate it with a good little spreader as/is, or mix it up with a tiny bit of heavy cream to smooth it out. If you do this, it should be creamy but not runny. Beets: Slice the skin off with a paring knife, then cut into 1/2 cubes. Place in a small serving bowl. Your guests will want to take a crostini, smear it with a thinnish layer of goat cheese, and pat a few leaves of arugula over top so they’re attached. They can then spoon over the beets in a single layer, and scoot some walnuts in the crevices of the beet layer. A little drizzle over of honey, and they’re all set. If you’re considering making these for yourself as a snack, totally do it. I happily ate the rest of my leftovers as a true salad (bare crostini alongside) so you won’t feel like you’re wasting anything. 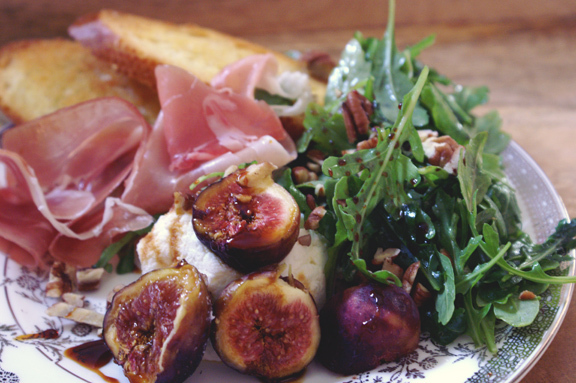 Things on a Plate: fig-pecan-molasses or apricot-pistachio-honey salad plates. 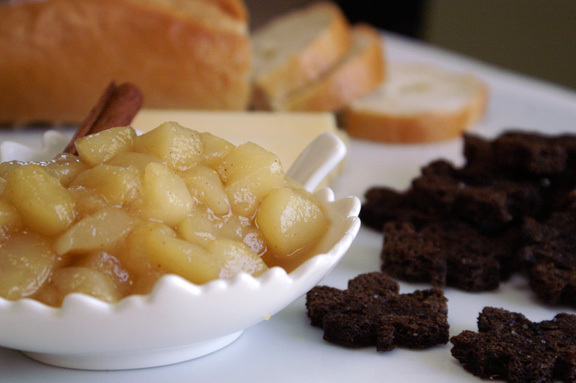 spiced pear compote (a sweet addition to a cheese plate). Love the sound of the brie + caramel, because I go crazy for brie en croûte. heh, spellcheck wants to change that to Croatia. I go crazy for brie in Croatia, doncha know. Your NYE party sounds like the most wonderful thing ever! gotta love spellcheck; sometimes i just let it go and i’m fine with texting someone about my love for brie in croatia. it messes with people. the brie/caramel one was really good, and so easy, because all you do is make a little carmel, and you’re basically done. I was pretty proud of myself the year i did the en croute one…i hadn’t yet really started to cook, so for a “fancy” dish, i was amazed it turned out. probably a testament to it being easy. It was pretty fun: no drunks, no pressure to like, dance or wear a minidress…so, perfect. New year’s has that slight smack of tacky to it that i sometimes embrace, but mostly choose to avoid when it involves toolish surroundings. I love the idea of “toasting” the new year! Thanks, Angie! We had quite a bit of fun playing with that as our theme; so many possibilities! Ahhhhhh!!!! I don’t know whether to be more chuffed over the pun “toast to your engagement” or the fact that you dedicated a whole post to little ole me or the fact that there is bread + goat cheese + beets!!! I’m so excited, bouncing up and down in my chair, and ever so touched by your marvelousness! Thank you!!! As usual, you must be tapped into my consciousness, because I bought a bunch of golden beets last night…and I already have goat cheese. So you know this will be happening asap! Yay! You liked it! It’s like i couldn’t write it and not dedicate it to you, because it seemed so very “you” on a plate. And I wanted to express my formal congrats on the engagement, and since we’re not in the same town (unfortunate, i think), you get my gift virtually this time. It makes my day that you love it. I am waiting to see golden beets at the market this year. I saw a few, then they were gone, and they should be coming back soon, i hope. I love those too, and how pretty would that be as an appetizer choice…a little mixed beet action! Now i’m pondering a trip to the store for more tonight. you rock too, Ashley. 🙂 here’s to roasted beets and friendship. P.S. I made that salad with the bacon candy and will try to post this wk! Amy, i won’t lie, we all got a total kick out of it, and i’m betting someday when i’m grown up and get to have actual real people over, i’ll whip it out again as a theme. 🙂 Maybe nate gets these as a welcome home present. He better not have taken that camera. eeeee! pins and needles! i hope the bacon candy turned out good! i’m anxiously awaiting your salad post…i’ve been thinking about it…that’s not creepy, right? that i just randomly wonder about salad? surely not. I totally tried for a roasted beet color in high school, but it ended up Little Orphan Annie red. It was SO gross. I wanted to make a whole lot of crostini for Christmas, but my mom’s response to that idea was “No one eats crostini, Brianne.” So I didn’t. But I still want to make crostini! And now I will. On a side note, my friends had a party last semester which included a crab-dip off. I had never tried crab dip before, and now I’m crazy addicted to it. Manic Panic can (and will) go horribly wrong; any of that semi-permanent stuff does, depending on your hair color. I stuck with that one, but lots of my guy friends (skateboarders, multi-colored hair) would try every color…with sketchy results sometimes. You can never tell, and you know when you’re in high school you have like, zero dollars and can’t afford to just go get it done properly. HA! seriously, a crab dip-off…only in my beloved Maine would a dip-off exist. it’s so good, right? I wonder how close theirs were to the one i make; i feel like the one i do is pretty classic/straightforward…nothing crazy involved. and OMG pear, walnut, and gorgonzola crostini? why didn’t i think of that? 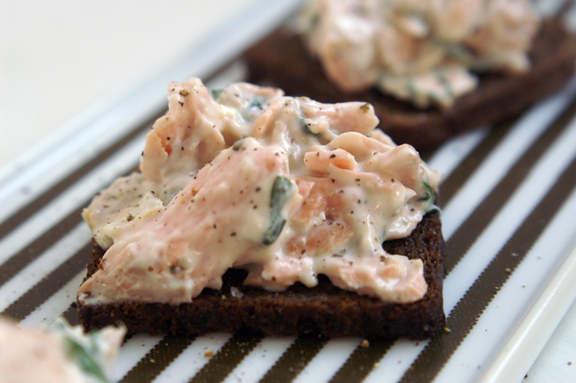 it’s like my favorite salad on top of a piece of bread, YOU’RE A GENIUS! I will thank you in advance from my future houseguests. and now, a confession: i’ve never had a beet. like ever. in my whole life. -_- should i be super ashamed? i knew it i knew it i knew it: someone was going to tell me they also Manic Panicked. It was going to be you. And it IS still available, and through the magic of the internets, we can order it online instead of time-warping it back to 1995 and taking a ride in my beat up hatchback down to the city to buy it at the one store that sold it. maybe i should post that one too? I can…so easy, and since gorgonzola is crumbly, i made a really good spread by whipping it with a bit of cream cheese and some heavy cream. so simple though, and we have so many pears in right now here. If i had had it, i would have drizzled it with a raspberry vinaigrette or something. really? never one time? try having them the way i made them sometime…it’s simple, there’s no other flavors to cover it up, and you can see if you like them or not. they get super soft and tender and they’re also lovely with a little sour cream, if you don’t feel like goat cheese. I could live on them. Sometimes i live on them. Do you like brussels sprouts? I should look back over the brussels sprout pizza comments. it seems like there’s a positive correlation between brussels-sprout fans and beet fans – same earthy vibe, i think. or, as Mr. Table so eloquently puts it, they both “sorta taste like dirt.” 🙂 He’s not a fan. So, Linda was all, “OOooohhhh…when are you making THAT?” And I was all, I don’t have to. We can just go visit Shannon and she’ll make it for us. So, she wants to know if you have snow, because we don’t want to travel in snow. no snow, ladies…no snow. We had a smattering on christmas, but i don’t actually think it was ever on the roads. today i swear it’s like 60 degrees out, so you’re safe. A toast bar sounds amazing; what a creative idea. This crostini, along with all the other flavors you mentioned, sounds amazing. Yum! Happy New Year, doll! somehow, i knew you would dig a toast bar. it’s very you in the way that it was very fun and exciting to do the combinations for all of us. happy new year, girl! here’s to us having a great time this year. Alright. That freakin’ crostini looks bonkers good. So, here’s what we’re gunna do: this term at baking school is all about European breads and those that are artisan. I will carefully study the breads. I will find the best ones for your next crostini bar. There will be a lot of yeast involved, so I’ll take care of the bread, and you’ll take care of the toppings. Then we’ll invite some people over and call it a food blogging conference. Also, we should probably dye our hair for the occasion. i’m so excited about Bread Term! and with today’s pretzel success, i’m riding high on a wave of false confidence, and that will fade shortly. I’d be much more comfortable if you handle the bread and i handle the toppings, for sure. Let’s co-crostini. here’s what: running a food blogging conference needs to be on some sort of long-term goal list for us. we would ROCK THAT. and we should absolutely call it “conference” in quotes so people know we’re going to have fun. my favorite peanut butter cookies.